CMR software. FILL YOUR CMR WAYBILL ONLINE! No install required, just use your browser. Portable, easy access with mobile devices, notebooks or desktop computers. Try! or Sign up and try Premium plan FREE for 14 days Choose a plan to try! There's no risk – you'll only be billed if you decide to keep your membership after your free trial. Filling by hand 5-10 minutes, with typewriter 5 minutes, printing: 10 seconds. Less working hours! No install required, use your favorite internet browser (Firefox, Chrome, IE, Safari etc.). Available languages: English, German, French, Spanish, Hungarian, Italian, Finnish. Is there any extra fee by sheets? The serial of waybill is auto incremented? Yes. This is required in some country. 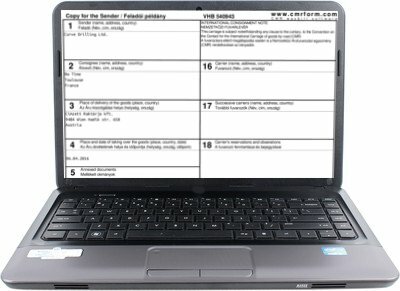 Do we need pre-printed CMR sheets anymore? NO! Just fill the form and print. No more trouble with typewriter ribbon or dot matrix printer.